Diesel Repair is the process of inspecting, repairing, and maintaining an automobile that runs on any type of diesel engine. Although diesel engines tend to last longer than gasoline engines, diesel engine repair takes a little more time and effort. Why is Diesel Repair Necessary? Diesel repair is necessary to ensure that your vehicle is running as it should be. 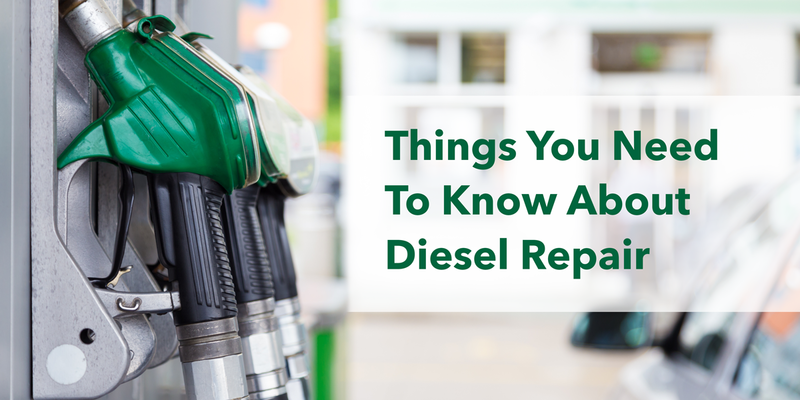 Just like your average car that runs on gasoline, cars that run with diesel also require necessary repairs and maintenance to keep it in good shape. When maintained properly, diesel engines tend to last longer than gasoline engines and save you money in the long run. What a Typical Diesel Repair Job Consists Of? Regular maintenance should become second nature once purchasing a vehicle that runs on diesel. Just because you’re working with a diesel engine, doesn’t mean that you shouldn’t take the necessary measures to care for and ultimately extend the lifespan of your car. Regular oil changes are definitely important when it comes to taking care of your diesel engine in order to prevent the engine from completely shutting down on you. Cleaning the fuel filter is a step many vehicle owners overlook when it comes to maintenance. Most do not realize how dirt can clog the entire system resulting in a pricey repair. To prevent spending more than you have to on something that is definitely preventable, make sure that you do routine filter checks. Changing the fuel and air filter. Depending on the circumstances, you’re less likely to have a number of issues with your diesel engine in comparison to an engine of a car that runs on gasoline. Because of this, you may find diesel repair being more affordable when looking at the bigger picture. Need A Diesel Repair? Schedule one below! What is the best way to reach? So when should you change the air filters in your car, truck, or SUV? What does the exhaust system of your daily driver look like?